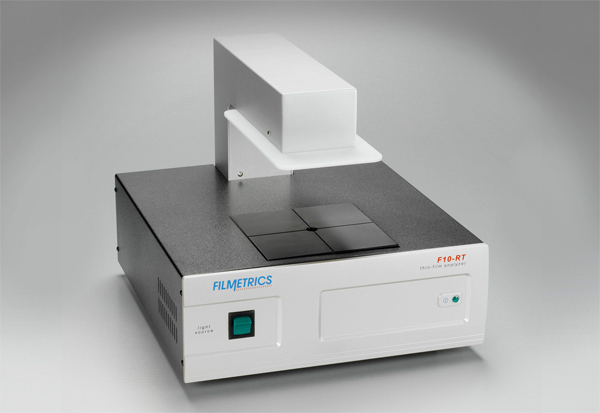 The F10-RT requires only a mouse-click to capture both reflectance and transmittance spectra by eliminating timeconsuming changes in hardware configuration. Data capture is fast – the array-based spectrometers typically take less than a second. 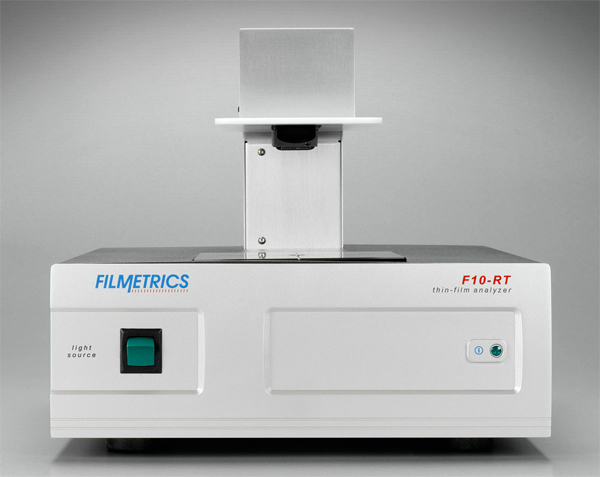 The F10-RT brings the power of Filmetrics analysis to simultaneous reflectance and transmittance measurements. 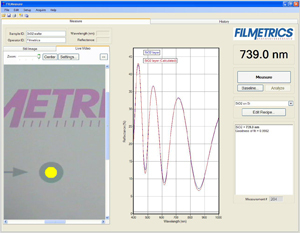 A click of the mouse instantly reports minimum and maximum reflectance and transmittance values in user-configurable wavelength ranges. Color analysis is standard and can be displayed in common color-space systems (e.g. CIELAB and CIEXYZ) as well as visually. 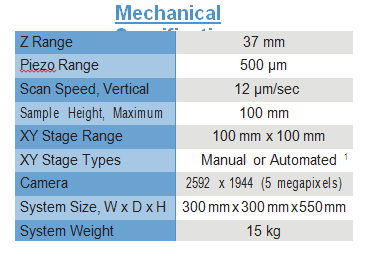 Measured spectra and other data can easily be printed and exported or can be saved in JPEG image format for easy distribution. 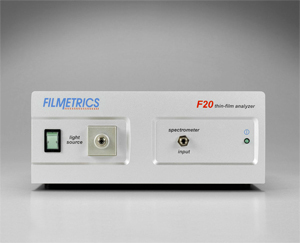 Optional film thickness and index solving modules give the F10-RT all of the advanced multi-film analytical power of the Filmetrics F20. The F10-RT arrives complete with reference standards. Its small footprint and USB connectivity ensure effortless setup. With no moving parts, no maintenance other than lamp replacement is necessary and high reliability is guaranteed. 1 Thickness & index solving are optional. 2 1σ of 100 measurements of 500 nm SiO2-on-Si. Average of 1σ over 20 successive days. 3 2σ of daily average of 100 measurements of 500 nm SiO2-on-Si over 20 successive days. 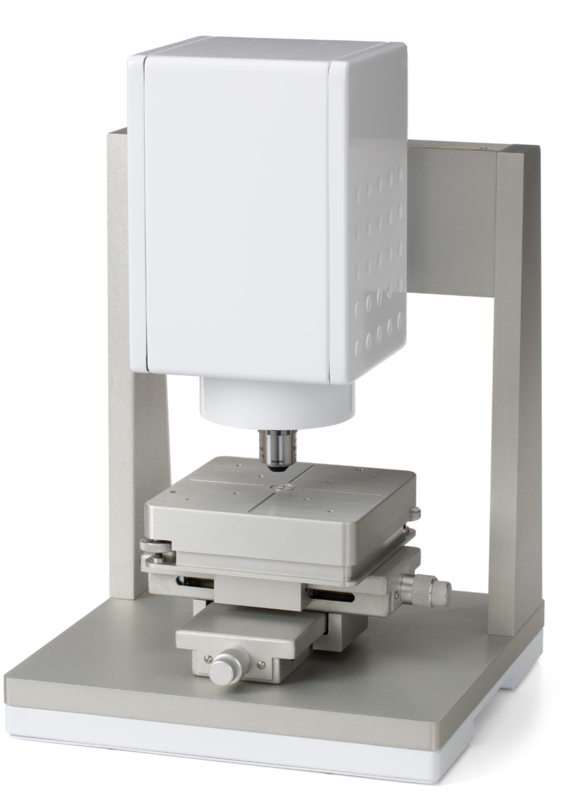 refractive index, and extinction coefficient in seconds. The included software and USB connectivity make installing the F20 onto any Windows-platform PC simple. 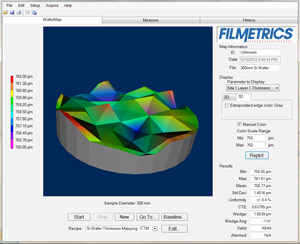 The robust software comes preloaded with a library of over one hundred materials, which facilitates the measurements of many different layer structures, including single and multilayer stacks, and freestanding films. 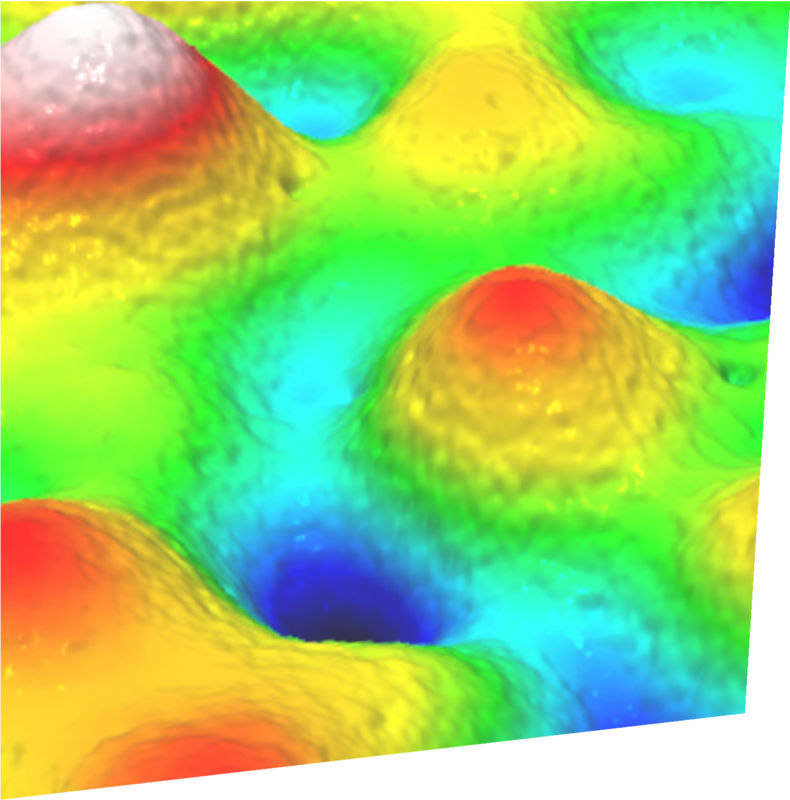 New materials can be added quickly by measuring the optical constants of samples or by importing data from an existing source. 1 1σ of 100 measurements of 500 nm SiO2-on-Si. Average of 1σ over 20 successive days. 2 2σ of daily average of 100 measurements of 500 nm SiO2-on-Si over 20 successive days. 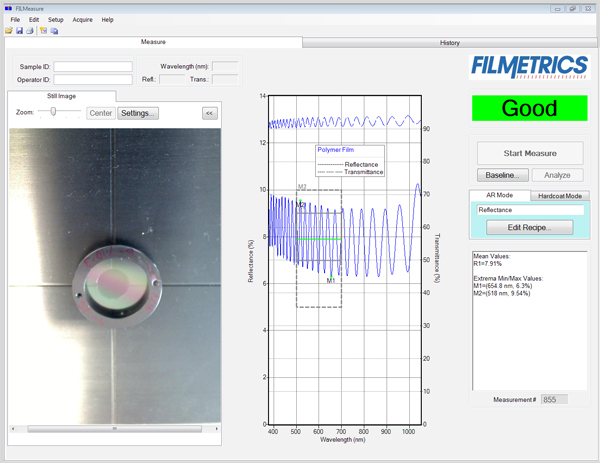 Thin-film thickness of samples up to 450 mm in diameter are mapped quickly and easily with the F50 advanced spectral reflectance system. 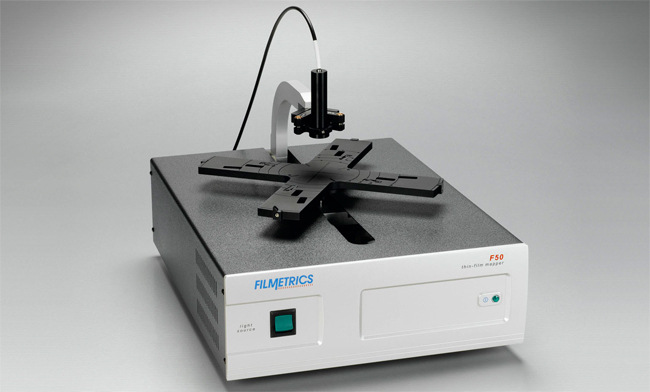 The motorized r-theta stage moves automatically to selected measurement points and provides thickness measurements as fast as two points per second. 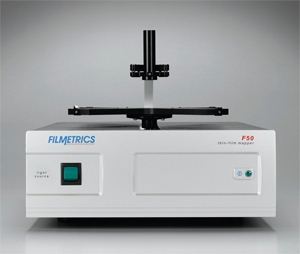 The F50 has the same precision high-lifetime stage that performs millions of measurements in our production systems. 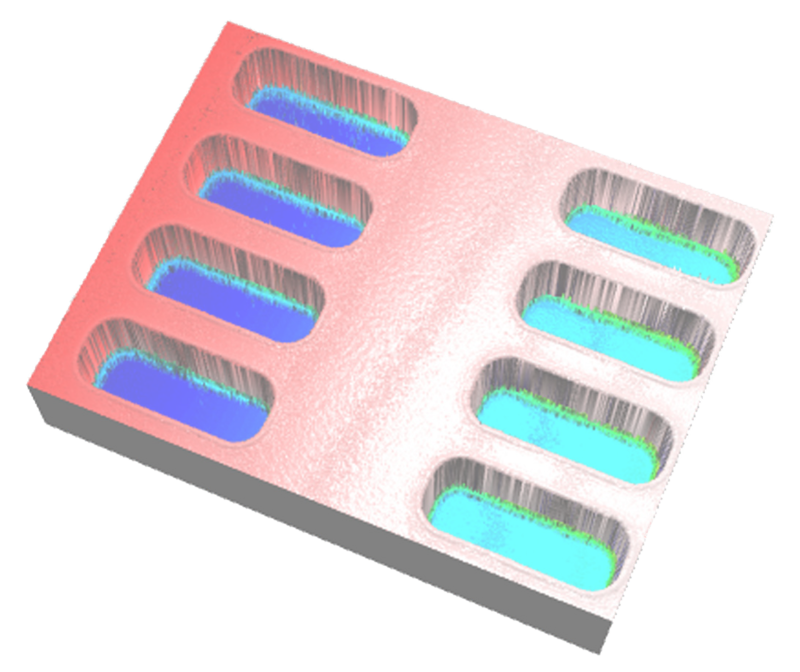 Choose one of the dozens of predefined polar, rectangular, or linear map patterns, or create your own with no limit on the number of measurement points. The entire desktop system is set up in minutes and can be used by anyone with basic computer skills. Vacuum Chuck): 5 points - 5 sec. 25 points - 14 sec. 56 points - 29 sec. 5 points - 8 sec. 25 points - 21 sec. 56 points - 43 sec. 1. 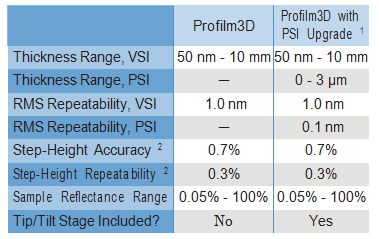 1σ of 100 measurements of 500 nm SiO -on-Si. Average of 1σ over 20 successive days. 2. 2σ of daily average of 100 measurements of 500 nm SiO2-on-Si over 20 successive days.